Kristen Wood delivers a pitch. The senior pitcher returned to the circle from injury last weekend, winning two of three games against Michigan State. Kate Drohan’s preseason expectation of relying on a deep, healthy pitching staff hasn’t exactly worked out. The coach has mostly relied on two arms in Big Ten play instead of the five Drohan had hoped to use. 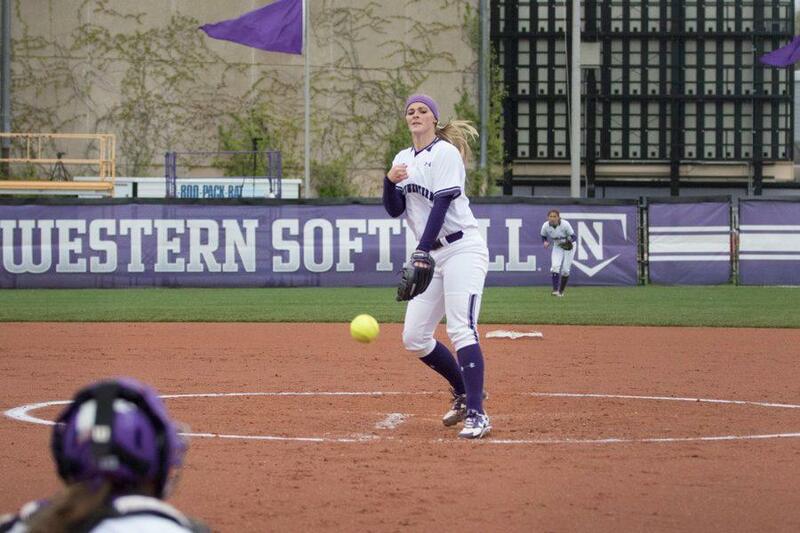 But the return of senior pitcher Kristen Wood from injury has given Northwestern (20-23, 10-7 Big Ten) another option as it travels to Wisconsin (26-19-1, 9-7-1) this weekend seeking to make a late-season push for an NCAA Tournament bid. Statistically, Wood has been far and away the Cats’ best pitcher this season. She leads the team with a 1.94 ERA and .215 batting average against. She has also struck out more than twice as many batters as she has walked. But Wood was injured in late March and missed a month, including NU’s first 14 Big Ten games. The Cats’ pitching struggled during that stretch, allowing at least 8 runs on eight separate occasions. Wood returned with a bang in last weekend’s sweep of Michigan State, starting two games and allowing just 3 earned runs in eight total innings of work. All season, Letourneau and freshman Kenzie Ellis have carried much of the load in the circle. Combined, the duo has pitched nearly two-thirds of all innings this season, and their 86 combined innings of Big Ten work is more than three-fourths of the team’s total conference innings pitched. Freshman Kaley Winegarner and junior Nicole Bond have struggled and tossed fewer innings, leading to NU’s greater reliance on Letourneau and Ellis. Winegarner has a 4.56 ERA, but that number jumps to an even 7.00 in just 16 innings of work in conference play. Bond, meanwhile, has an ERA over 10 and hasn’t pitched a complete inning in a Big Ten game. But Drohan said she remains confident with her whole rotation, as she has throughout the season. “I like our entire pitching staff and their mentality right now,” she said. Ellis has also struggled somewhat in her seven Big Ten starts with an 8.47 ERA and more walks than strikeouts in those games. Nonetheless, the freshman has an even 4-4 record in conference play and has lowered her season ERA by nearly 2 runs in the last three weeks. Letourneau has pitched well all season — her nine wins are by far the most on the team — and she holds a 3.26 ERA in conference play. But unlike some college pitchers, she cannot be counted on to pitch significant innings in several consecutive games. Wisconsin’s Taylor-Paige Stewart, for example, pitched 15 innings across all three games in a recent series, and Purdue’s Lilly Fecho has started 27 games this season. Letourneau, meanwhile, has made 18 starts and has not pitched in all three games of a weekend conference series. Wood’s return, however, gives the Cats another strong option in the circle. With just seven games left in the regular season, Drohan realizes the importance of having all hands on deck.